It happened yesterday. 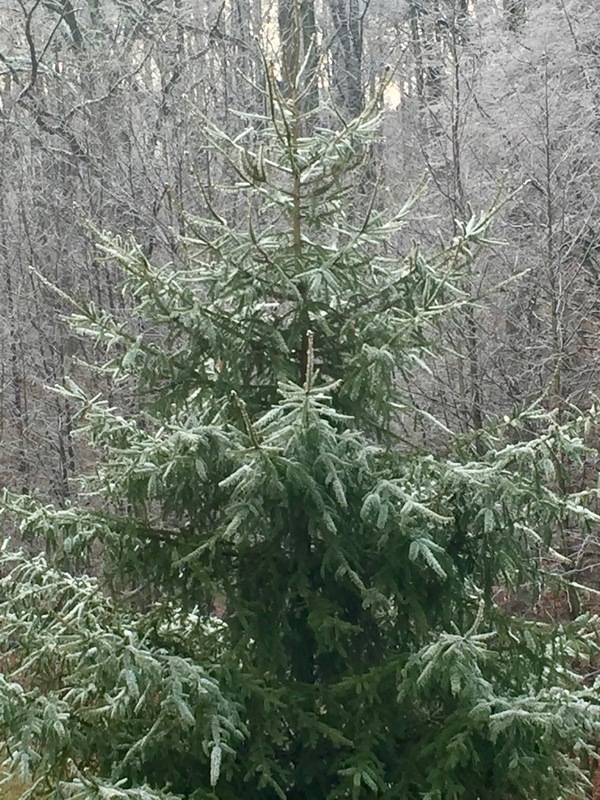 We received the first snow of the season here in Elkridge. 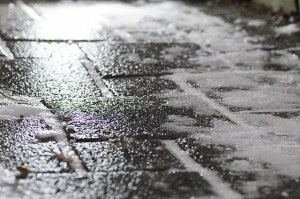 It was, I hate to admit, pretty falling from the sky as gentle flakes blown about by the wind. It was even prettier because it did not accumulate and therefore did not cause additional work. It was cold outside. It has been cold now for a couple of days. Too cold to do much outside, except watch for a few moments the snowflakes falling from the sky. 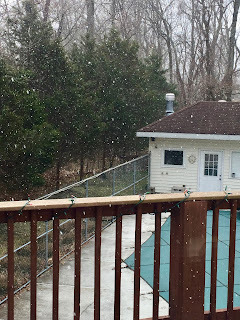 It is fitting that the next to last day of the year should being the first snowflakes of the winter season to my home. I hope the last day of the year is more mild, although the temperature is starting very cold at 27 degrees. 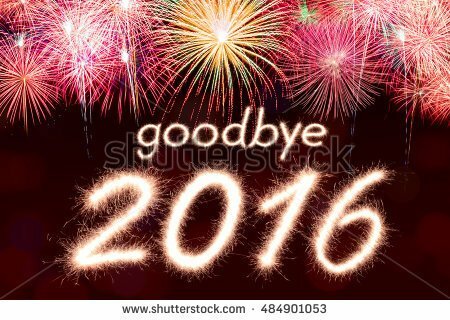 Well, as it is the last day of 2016 here is my wish that all of your dreams come true during 2017. Take a moment of pause today and recount the blessings of 2016--even though there has been hurt and loss, there are things to be thankful for during the year that is closing out. Happy New Year! May your 2017 be blessed. As 2016 draws to a close I am reading about the highlights and lowlights of the year from many sources. It is something that I find beneficial, reviewing the year before closing that chapter and turning the page for a new year's arrival. 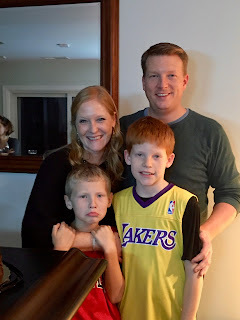 As I reviewed the year in pictures, I remembered starting the new year with Mom and Dad in Elkridge and then driving to upstate NY on New Year's Day when traffic was light. We stayed there until the 3rd and returned to Elkridge under sunny skies. There was a fantastic party at a local climbing zone for Lucas to celebrate one of the first birthday's of the year. It was the first of many gatherings. There was a big snowstorm on January 22-23 which kept us snowed in until the plows finally cleared the street on January 26th. It was way too much snow. I attended a Garth Brooks concert in Baltimore on January 29th. It was awesome. 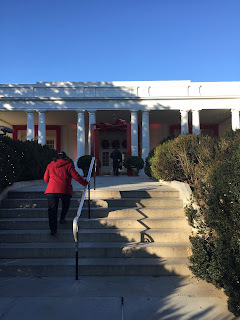 February was quieter with just a trip to Northern Virginia to attend the Fauquier County Wine Tasting event. March saw the annual Orioles Spring Training trip with the guys for baseball and golf. Sarasota and Florida was warm and spectacular. March also saw the inaugural lawn mowing of the season, a sure sign of Spring. 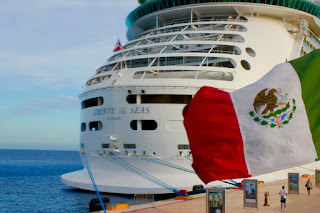 On Easter Sunday, during Late March, Chris and I departed for our first cruise of the year to the Bahamas. It was Spring Break and we went to Fort Lauderdale and the Bahamas and had a great time. 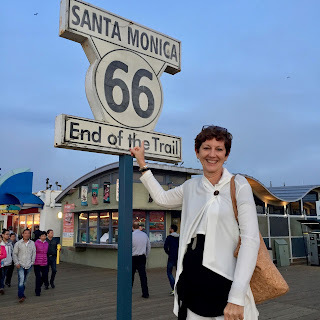 The trip lasted until early April. April was busy as we competed in the annual Keswick Consensus Blending and I took a business trip to Alaska. It was a long trip to the great north. At the end of the month Chris and I headed off to St Michaels for the Wine Festival! It truly was a busy month. May saw the pool opening and the beginning of the summer season. I installed a new sink for Chris and we celebrated Patrick's Master's Degree in Cyber Security! We also had a visit from Faline, the fawn. June passed with Ethan's graduation form Elementary School and the end of the season for Jackson's baseball team. Then there was the trip to Upstate NY for Trevar's graduation from High School! 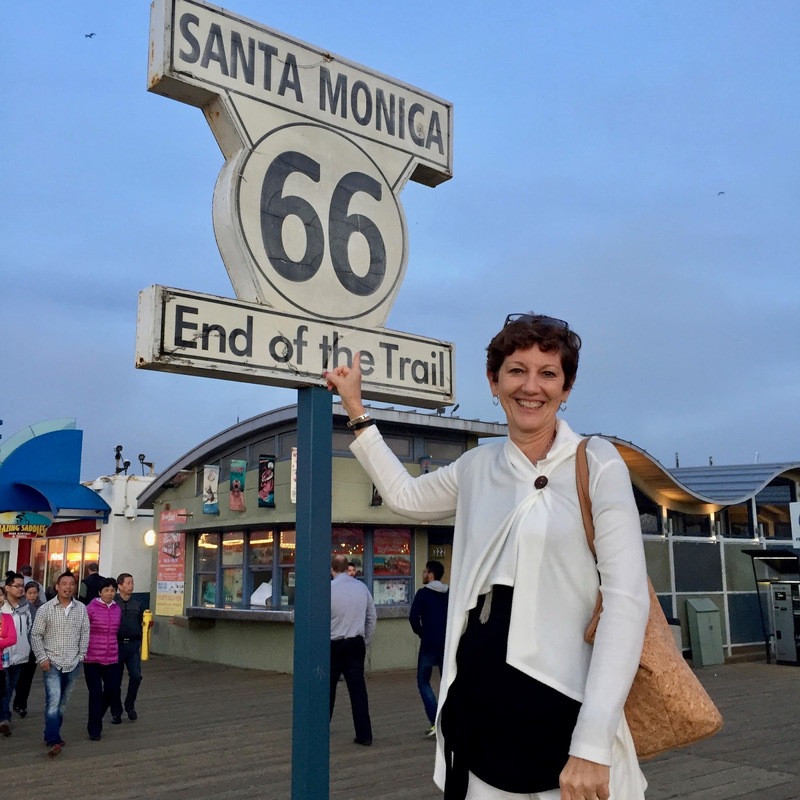 During July, I made my first trip of the year to California. My second would be during November with Chris to revisit the cool finds I made during the July trip. Chris and I also departed on our Caribbean Cruise with Pennie and Scott which had an altered itinerary due to a hurricane. We never made it to Belize or Honduras. August saw the annual Troy Whittemore Golf Tournament in the rain in Trumansburg, NY. September was quieter, but October began with a trip to NYC with Ethan. It ended with a trip to Las Vegas to celebrate Jeremy's birthday. The highlight of the Vegas trip was playing TPC Las Vegas! November was the do-over trip to California which included a visit to the Ronald Reagan Library and Museum. A spectacular spot. 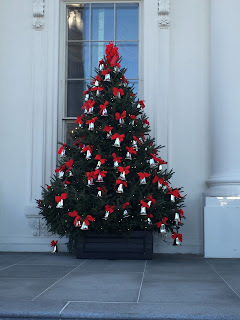 December's highlight was the tour of the Christmas decorated White House. And of course, Christmas with the family! What a year. I'm exhausted just writing about it. And those were only the highlights. With the holiday season nearing an end, exhaustion seems to be the call of the day. The frenzy of shopping and returns and getting ready for the big days has crested and life is slowly returning to a more normal pace. The weather has been, until this morning, fantastic with Tuesday reaching into the 60's. Yesterday my thermometer reached 50 degrees and it was another beautiful day. I even managed an hour at the driving range hitting some golf balls and was appalled at how my swing has suffered during the nearly two months since I have been on a course. 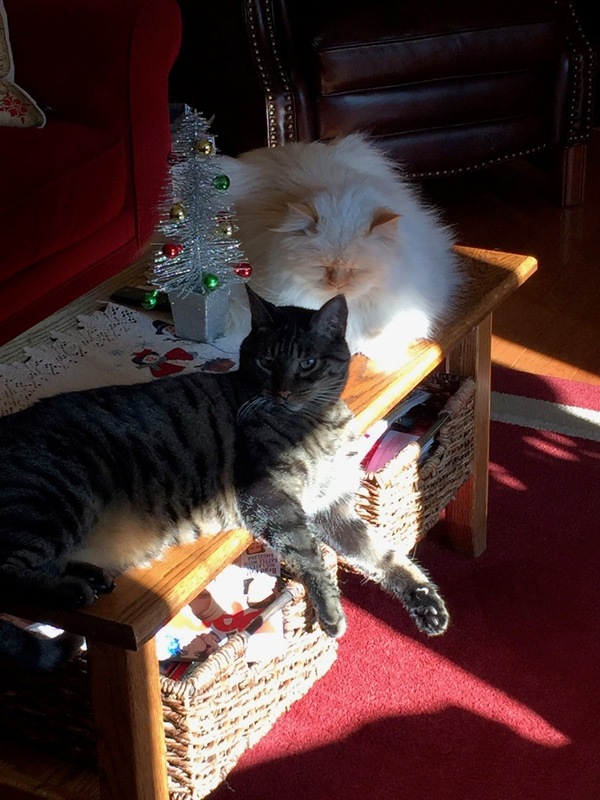 With all of the activity of the past weeks, I think my cats, Riordin and Louis got it right the other afternoon when I found them lounging in a sunbeam on a coffee table. My cats always seem to know what needs to be done. Anytime I can take a nap in a sunbeam is good. Now, all I need is some sunshine to land on my bed while I take a nap. The passing of Carrie Fisher yesterday was another dose in a year of multiple reality checks. It was a bigger shock to realize that she is younger than me! 2016 has been a tough year with the passing of so many stars and notable people. The list, which continues to grow can be found on Wikipedia, as well as many other sites. The Mirror has a nicely done list with pictures of the celebrities. I am not going to run through those that touched me in a special way except to note that there were more than a few. The passing of Carrie Fisher caused a large disturbance in the Force. She was one of the stars of three of the Star Wars movies. I am a fan of the movies and her character was inspiring and decisive. With each passing, I am reminded of their impact on society. Even though they may have been entertainers or sports figures, many of them brought other important issues to the forefront of our consciousness like Muhammed Ali and his heroic battle with Parkinson's Disease. I am having a positive affect on them. I don't usually write about the gifts I receive for Christmas, however, this year I am going to make an exception. I received a new hobby as a Christmas gift this year. 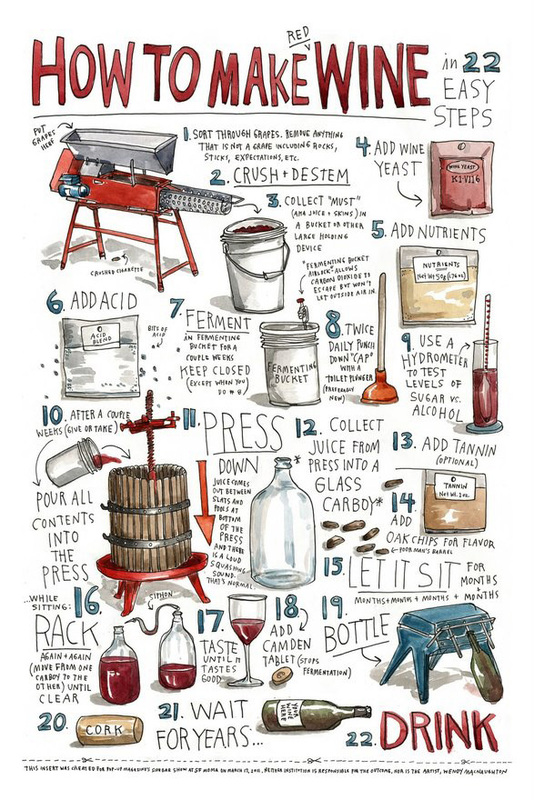 Actually, it is an extension of my current wine hobby--I am going to try my hand at winemaking! I received winemaking equipment for Christmas. I have been studying the art and craft of winemaking, but now I will have the opportunity to do it for myself. I know that it is more than a formula or a recipe to follow. The interesting part is that we are reconfiguring our house to support this expansion of our wine hobby. Yesterday I moved beds and dressers around, including up and down stairs, to make room for the wine making area. The scary part is that I will be making about 30 bottles of wine. That is two and a half cases! It is going be painful if the wine is terrible and has to be poured out. Well, it takes about two months and I haven't really started yet. But I am getting excited. 1. Today is the last Monday of 2016. 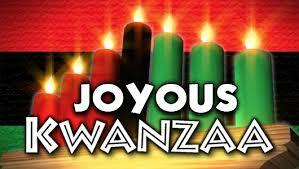 It is also Christmas Observed, Boxing Day, the continuation of Hanukkah, and the beginning of Kwanzaa. 2. Top headline in the New York Times yesterday: Trumps Hurry to Unscramble Business Ties. 3. What was the best gift of Christmas? Answer: Family! 4. The Baltimore Ravens were eliminated from the NFL post-season hunt yesterday. I am ready for baseball season to begin. 5. I love it when the dawn arrives and the sky is clear. 6. I enjoy holidays more when the day after is also a holiday. For instance, yesterday was Christmas, but today is Christmas Observed. It provides an extra day to recover. 7. I am already behind in planning my summer vacation! 8. Next up--New Years! 2017 is fast approaching! 9. I guess I am going to have to start working on my Year in Review! It was dark outside. Christmas Eve had given way for Christmas Day. The brunch from the day before was a memory. 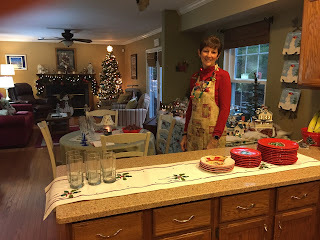 Even though there were no children in the house and no reason to be up until well after dawn, we were awake to enjoy the arrival of Christmas Day. The tree was brightly lit and the Snow Village beamed its light across the darkened room and the house was quiet. The TVs were off, the only thing we could find to watch was a 1939 movie titled Return of the Cisco Kid. Seriously! 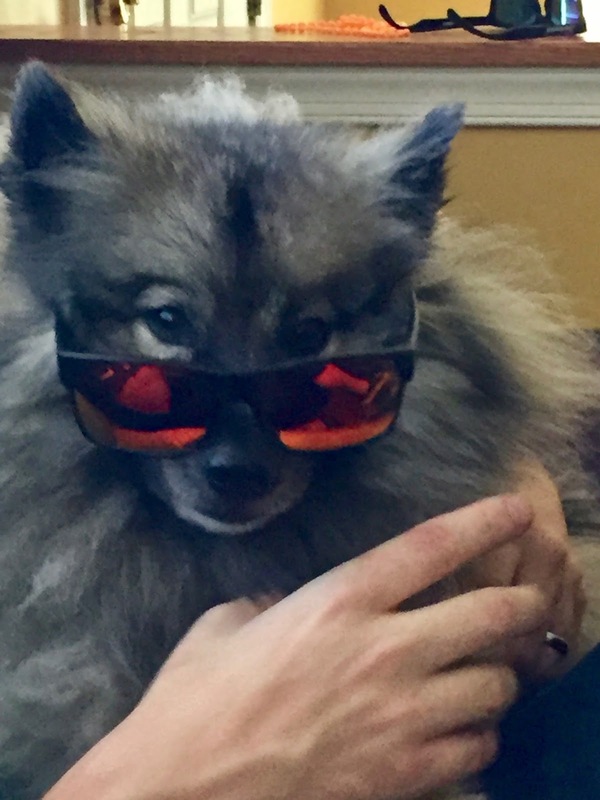 It was too quiet around the house and the only noise was the whining of the dog. The presents were piled around the tree in anticipation of the noise and excitement that would follow during the day. It was a quiet time for reflection on the season. Dawn on Christmas Day is still 50 minutes away, but the sky should begin filling with color soon. I can imagine the shepherds sitting in their fields two millennia ago being startled by light in the darkness. 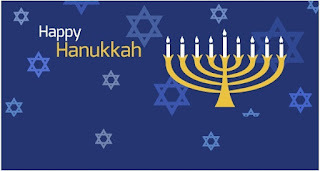 May you find joy today and through the whole year. 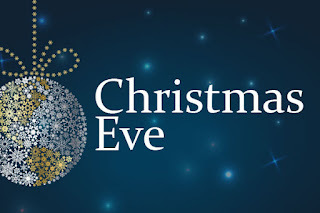 I remember as a child the excitement, almost painful excitement, of waking in Christmas Eve and realizing that after an excruciatingly long day, the most exciting day of the year would dawn. Christmas Eve is all about traditions in my family. We fill the day with family-oriented events to help build the excitement and make the holiday last longer. I know that personally, I usually like to go out shopping on Christmas Eve--but, fortunately this year all of my shopping is complete and all that I really need to do is wrap the gifts. "May we give thanks for a free America, an America united in the wonder of a season that includes not only Christmas but Hanukkah as well. And as we light this glorious tree, may Nancy and I offer a final wish to all Americans: that every Christmas that follows will be as full of joy as we have these past years to work in your service. May God bless you all." 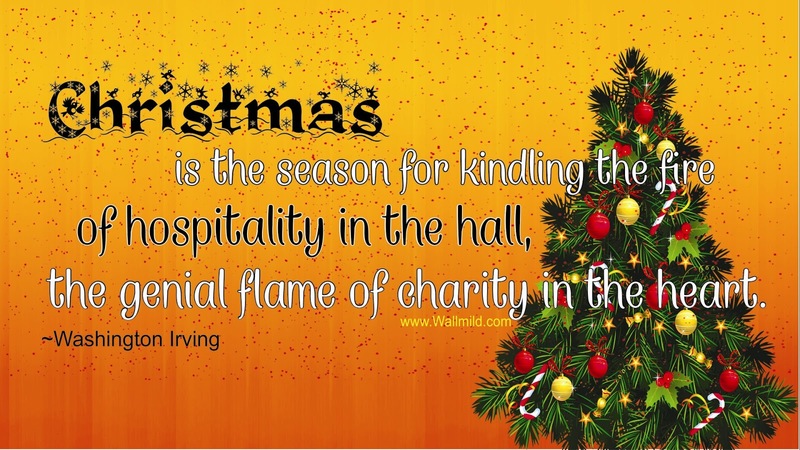 May the blessings of the season fill you with joy and wonder. 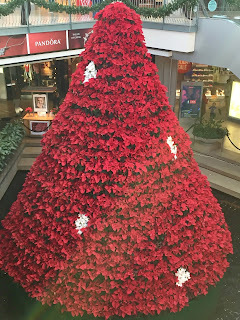 I sojourned to the Columbia Mall, by myself, yesterday to complete the shopping task. It was relatively easy given that I had a pretty well defined list. I also had the opportunity to view my favorite Christmas decoration--the Poinsettia Tree that graces the center court in the Columbia Mall. I enjoy looking at the tree. But, more importantly, I have completed my Christmas shopping and I'm ecstatic. Now all that remains is to wrap the presents in preparation for the unveiling. Well, I have to decide the order in which they will be opened. But, at least I can relax now and enjoy the holiday. Not really, it gets even busier from here. Maybe on Monday I can take a deep breath. I felt it as it happened yesterday morning at 5:44 AM EST. Winter arrived with the solstice. Unheralded, but it arrived nonetheless. Autumn departed and the shortest daylight day of the year happened. Daylight amounted to 9h23m59s. Ugh! No one noticed. I had scheduled a holiday party to keep from becoming too depressed about the advent of winter. I could use a trip south of the equator to enjoy some searing sunshine. I know that snow is in the forecast--not for this week, but for very soon. The holidays are coming and they just scream for snow. I hope it holds off. Maybe we can have a winter with less than 1 inch of the fluffy white stuff. Springtime is about 90 days away, it begins on March 20th. That means we only have to get through a few short months! It is the holiday season for sure. I made an astounding discovery the other day. Three of the next four Mondays are federal holidays. December 26 - Christmas Observed (Yes, Virginia, Christmas is a Federal Holiday and so you can say Merry Christmas without offending anyone). 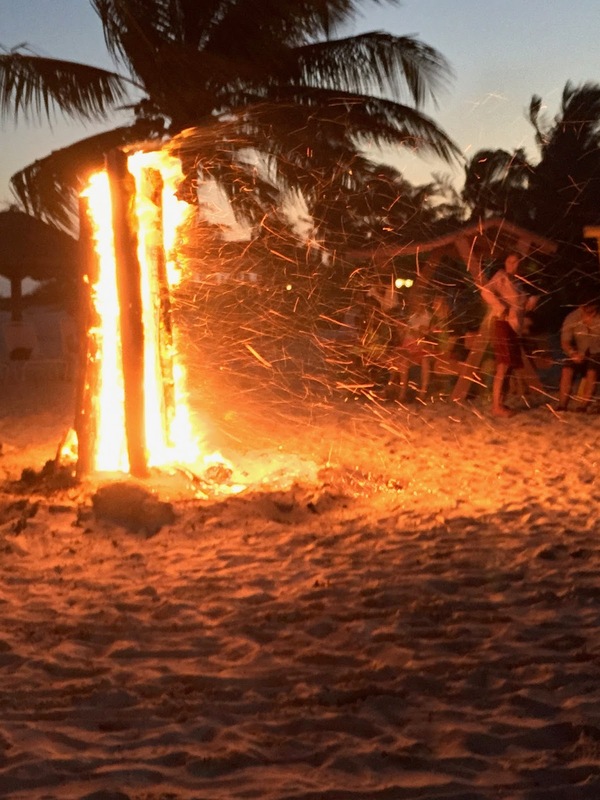 January 2 - New Years Observed. 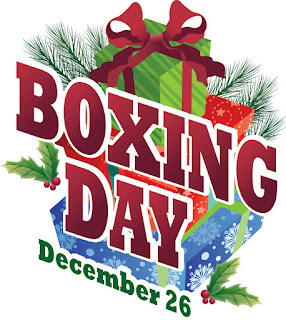 January 9 -Not a holiday! January 16 - Martin Luther King Jr Birthday. There are 10 federal holidays each year and three of them are crammed into a four week span. This year they are on Monday, as they will likely be next year as well. That makes for a convenient three-day weekend. If only the weather were warmer and I could hit the golf course. If only I were more motivated and could finish my Christmas shopping. Happy Holidays--there are three to enjoy! The votes are cast and the election of 2016 is finally complete. The results will be certified on January 6, 2017 and a few short weeks later on January 20th, Donald Trump should become the 45th President of the United States. The Electoral college put the exclamation point on the election. 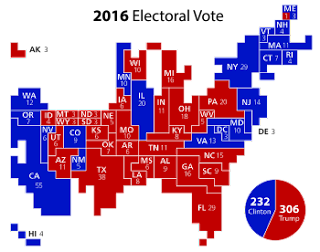 The final vote was 304 for Trump to 227 for Clinton with A few others receiving stray votes which is why the votes were not exactly as expected which was 306-232. Hopefully, the country can find find unity behind our new leader who clearly is the outsider that many voters desired. He definitely seems to have some unique and unorthodox ideas. As our newly elected President takes office, I hope that he remembers that as the leader of the free world, every word he speaks is scrutinized for weakness and intent. As a nation we need to dream of greatness. We have every right to dream heroic dreams. Those who say that we're in a time when there are not heroes, they just don't know where to look. You can see heroes every day going in and out of factory gates. Others, a handful in number, produce enough food to feed all of us and then the world beyond. You meet heroes across a counter, and they're on both sides of that counter. There are entrepreneurs with faith in themselves and faith in an idea who create new jobs, new wealth and opportunity. They're individuals and families whose taxes support the government and whose voluntary gifts support church, charity, culture, art, and education. Their patriotism is quiet, but deep. Their values sustain our national life. The President, is the President of every American and he must never forget that. 1. This is the next to last Monday in 2016! In two too short weeks it will be January 2, 2017! 2. 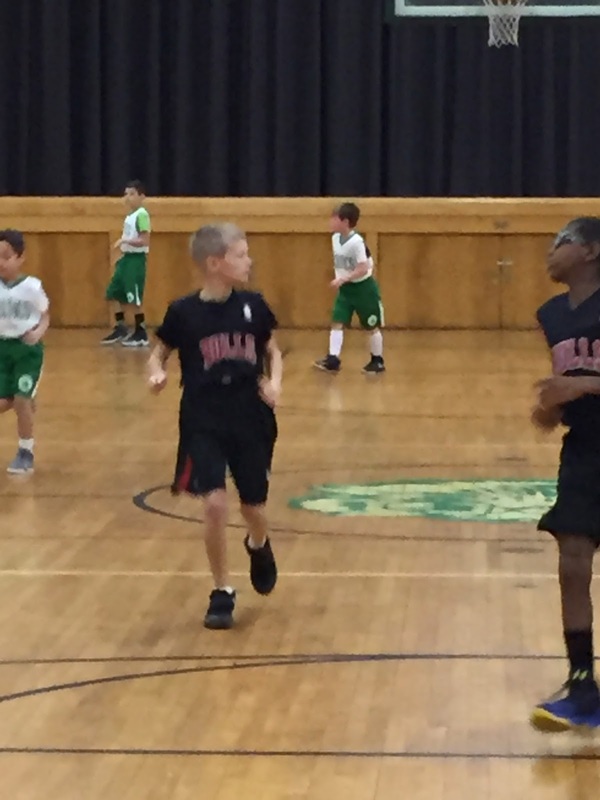 In youth basketball yesterday, Jackson played a mean game of basketball, his team won 20-7. Ethan's team salvaged a 12-12 tie after a single overtime period. 3. I saw Rogue 1 yesterday. It met all of my expectations and then some. Recommendation: See the movie! 4. The weather has become very seasonal, it is cold! Too cold! 5. 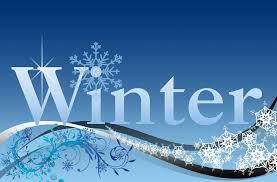 Winter begins on Wednesday, December 21st, at 5:44 AM EST! Total daylight for that day in Baltimore will be 9h23m59s. That is 5 seconds less than today. 6. The NFL season continues in its lurching fashion. All of the family's teams remain in play: Dallas has clinched a playoff, the Steelers and Redskins currently possess playoff spots and the Ravens are in the hunt! 7. Today is Electoral College Monday! Will the final be 306-228? The President-elect should be official. 8. The ice on the trees Saturday was pretty in a surreal kind of way. 9. I hope the next two weeks are quiet! I would be nice to end the year on a calm note. 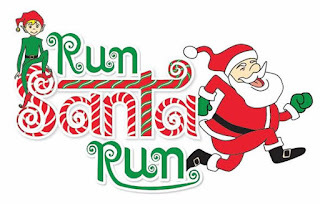 The holiday marathon breaks into an all-out sprint for the finish line culminating with Christmas and Hanukkah next Sunday. It might be a good time to slow down rather than to speed up. 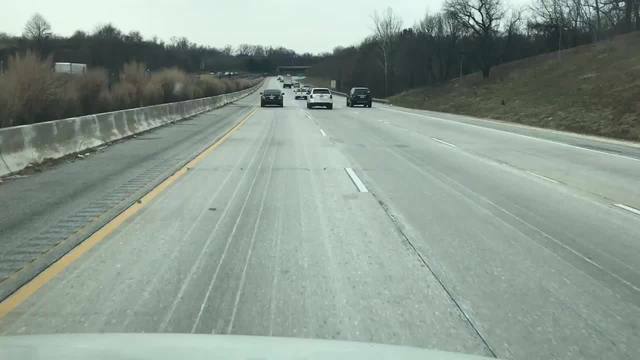 Yesterday's icy weather brought the first reality check to the Baltimore region as there was an incredible 67 vehicle pile-up on I-95 that claimed the lives of two people. Today, however, the temperatures are already in the 50's. 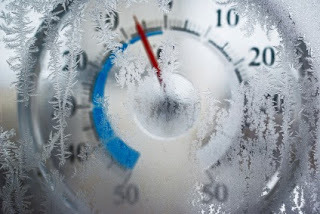 Reportedly, the temperature rose 40 degrees in one hour overnight. By this afternoon, the temperatures will be back into the 30's and there is snow in the forecast. I noted that at dawn this morning, the temperature in Elkridge was 56, Ithaca was 40, and Houston was 36 degrees. It is definitely an upside down weather day! Every day during the coming week had some event or activity connected to it. If I take them one-at-a-time, I will successfully complete the week and be prepared for a fantastic celebration. Today's major activities: two basketball (Jax and Ethan) games and Rogue 1. I wrote of the frigid weather yesterday. Today, it is worse. While not colder, it is actually 15 degrees warmer, we are besieged by freezing rain which is shutting down the entire area. As I have been watching the news this morning about the multitude of accidents, I am thankful that I don't have to travel this morning. The roads were pretreated yesterday, but the volume of rain falling on the frozen roads has overwhelmed the pretreatment. The airport is canceling flights due to the ice. Accidents are everywhere. It is a good not to have to go to work this morning. I am looking forward to temperatures which are expected to rise into the high 50's by tomorrow afternoon, even if only briefly. For now--be careful out there. It is a mess. Sliding, as we are, into the beginning of winter, I should have expected something like this, but the frigid cold is truly a shock to my system. 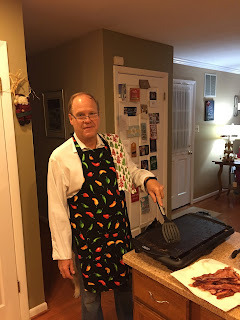 The temperature last evening as I finished dinner was a whopping 16.5 degrees and this morning it was 13 degrees. Too cold to even think when I am outside. It was also 13 degrees in Ithaca. It was 73 degrees in Key West, Florida. I didn't think it was supposed to get this cold in December? What happened to Global Warming? Last Christmas I remember temperatures in the 70's. We even golfed the day after Christmas. Frankly, I am nowhere near ready for this weather. The daylight is receding and darkness is enveloping the land. Where are the Druids when we need them? In looking at the 10 day forecast, it is clear that I will not be golfing before Christmas unless I win an all expenses paid trip south. It is the holiday concert season and last evening I was able to attend the strings concert at Waugh Chapel Elementary School. What do the meanest middle linebacker on the GORC 80 pound football team and one beginning violin player at Waugh Chapel Elementary have in common? They are one in the same: Jackson. A well rounded life includes an appreciation for music. Holiday Concerts showcase developing talent. Ethan also had his holiday concert last evening. Unfortunately, for some unknown reason the two schools scheduled their festivities for the same time and I could only attend one. Holiday concerts are one of the joys of the season. While the music may not be executed like the recordings we are listening to, the enthusiasm makes up for everything. Happy Holidays. Rather, I mean, Merry Christmas. Autumn is slipping quickly into Winter and the days are becoming shorter. With so much to do, the short amount of daylight is deceiving and by 5:30 PM, I have been feeling like it is bedtime. 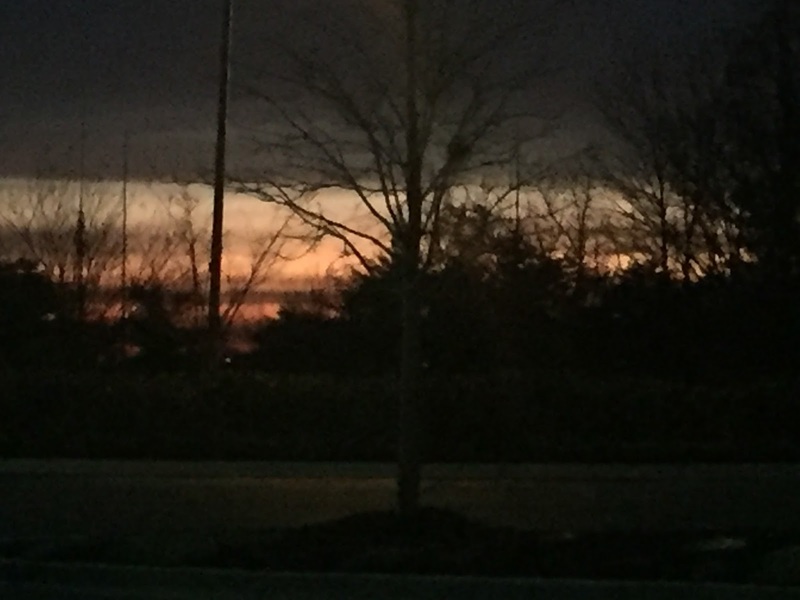 With that backdrop, rewind to yesterday morning as I was coming out of the gym after playing racquetball. It was dark, but on the eastern horizon the first rays of light from the rising sun were silhouetting the bare branches of the trees and beginning wake the world. 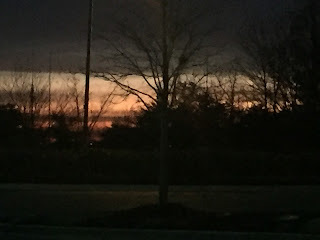 The street light was casting its cold illumination onto the parking lot, but was soon eclipsed by the gathering rays of the still hidden sun. I admit, I felt funny standing in the parking lot taking a picture of the darkness. But seeing the first colors of the day reminded me that all is not dark and that the light returns to the world with each new morning. From the first rays of the morning, the light strengthens and the world wakes. They arrive every year. They arrive whether we want them to arrive or not. Birthdays. When I was young I always wanted to be older. Now that I am older, I want to be younger. I never seem to be happy with my birthday. This weekend, Nicole turned another year older. Her birthday made me feel older. Too much older. I cannot comprehend that my daughter is getting older. And that she has sons who are getting older. From our youth to our old age. We celebrate each additional year on the planet. 1. There are less than 2 weeks until Christmas, I am finding it hard to believe how close the holiday is rushing towards me. 2. 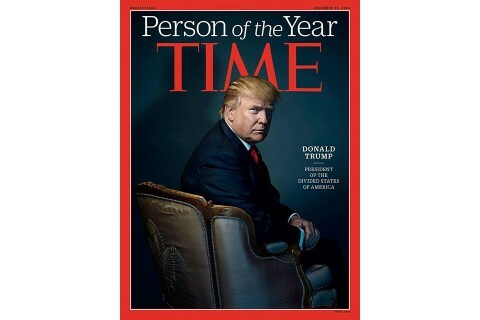 Time Magazine selected the President-elect as the Person of the Year, but I take exception to the subtitle: "President of the Divided States of America." 3. Why do cars seem to need brake jobs on some of the coldest days of the year. 4. I don't like snow! During my short trip to Central New York this weekend I saw enough and drove through enough snow to last an entire winter. 6. Has anyone wondered why the Russians supported Donald Trump to be President? 7. 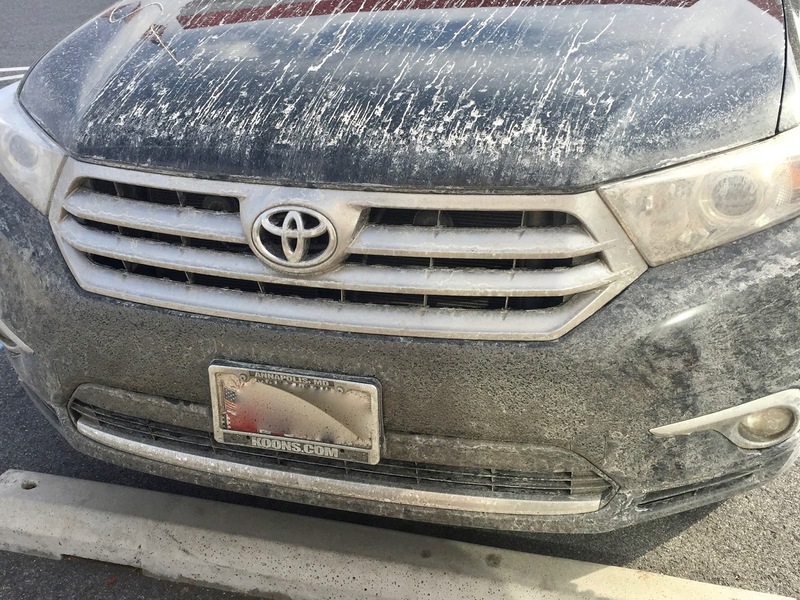 Cars seem to take the brunt of winter weather by getting very dirty. 8. I am a bit bummed because the temperatures have been to cold to golf. I miss chasing the little white ball around the course. 9. I want to say thank you to the Congress for passing another continuing resolution and preventing another furlough. Now let's see if they can finalize a budget. Visiting the White House during the Christmas season is an experience not to be missed. 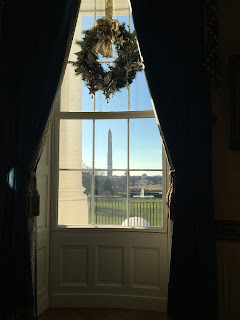 On one of the coldest mornings of the season so far, Chris and I headed into Washington, DC, for our appointment, with eight of our friends, to tour the Christmas decorated White House. There is something truly special about visiting the White House. It is the "People's House." 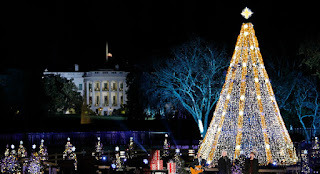 The White House is decorated festively and each room holds new excitement. The self-guided tour allows for thorough exploration of the decorations and the rooms. The tour enters through the East Wing and winds through the White House coming out through the front entrance. I found security to be efficient and the Secret Service agents to be pleasant but thorough. 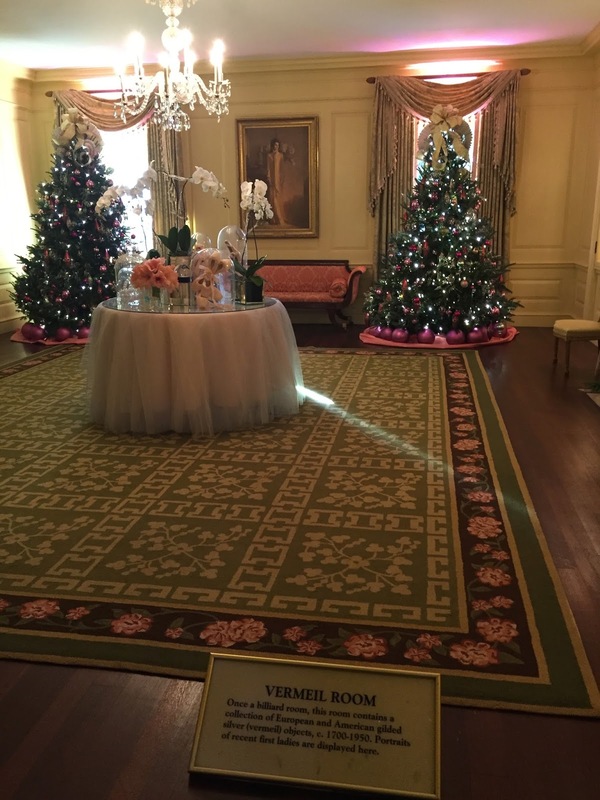 The Library, the Vermiel Room, the China Room, the East Room, the Blue Room, the Green Room, the Red Room, and the State Dining Room are all on the tour. The exit is out through the front and we had some great pictures taken in the doorway. Along the tour, however, there are decorations and lots of art to enjoy. The art is fantastic and represents a wide cross section of American art. 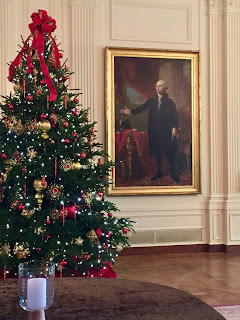 It is not just portraits, but one of the most famous is that of George Washington painted by Gilbert Stuart in 1796 and hangs in the East Room. This painting was saved by Dolley Madison when the British burned the White House. I highly recommend this tour and I thank my good friends who did all of the work to get our group approved and scheduled. Unfortunately, this tour must be requested months in advance and so it can't be done this Christmas, but next Christmas is still possible. What an interesting day I experienced yesterday. 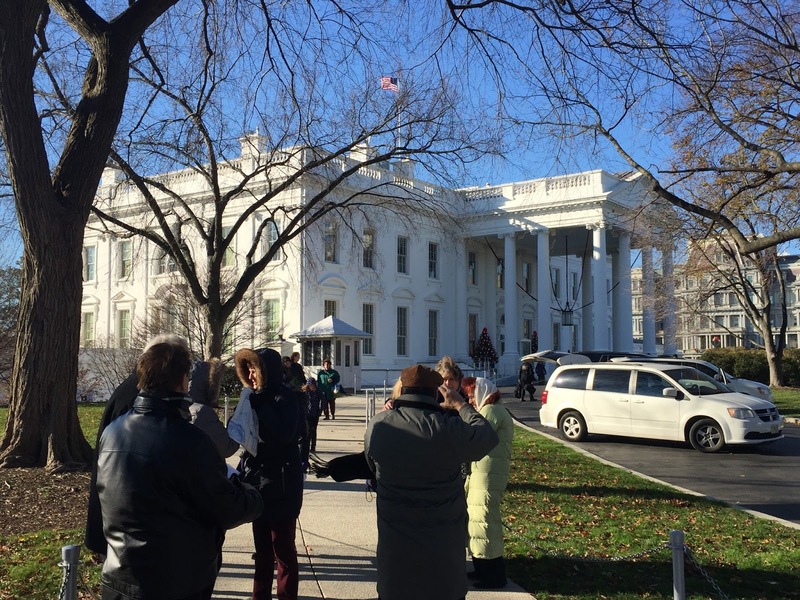 The day began in Washington, DC, with a tour of The White House and ended with an arrival at my parents house near Ithaca, NY. The White House tour was fabulous. It was cold waiting and walking around DC, but the tour was definitely worth the effort. I will write more about the tour itself tomorrow. What was really interesting was that Chris and I were back at our house by 1130 AM, and I was on the road for Ithaca an hour later. The trip to Ithaca started with the Baltimore beltway being shut down due to an accident, but WAZE got me around it. I drove into a snow squall in Shamokin Dam, but drove out after 10 miles. The rest of the trip was thankfully uneventful. 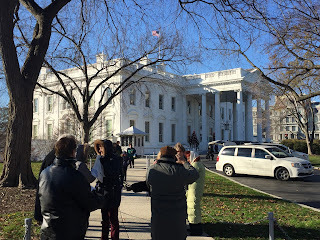 What a day, however, it included the winter cold of DC, the elegance of The White House, and the snow of Ithaca. 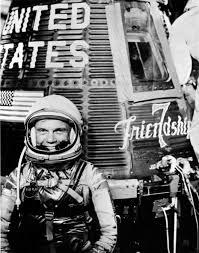 The passing of John Glenn at age 95 yesterday caused me to pause. The New York Times calls him an American Hero of the Space Age. 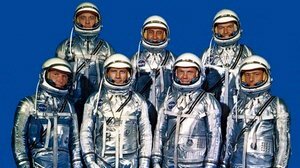 He was the last surviving member of the Mercury 7--the first seven astronauts selected by NASA. I remember growing up and following each successive barrier that was broken and each new achievement that was made during the Cold War Space Race. The pride of the country rode on the backs of a few brave men, yes they were all men then. I learned new words like Mercury, Gemini, and Apollo. I also learned about Redstones, and Saturns; the boosters that these brave barrier breakers rode into the heavens. My mind was on the space and space travel as I considered the possibilities. In my young mind, I believed that we would have missions to Mars during the 1990's. For a while I wanted to be an astronaut and ride the fire into the heavens. The country chose to go another direction in space; developing the highly successful Space Shuttle program to haul payloads into low earth orbits. The dream of Mars remains. Sadly, the United States does not currently have the capability to launch people into space. There are no man-rated boosters or vehicles in the inventory and the cruel twist of fate is that we are dependent upon to Russians to carry Americans into orbit to the International Space Station. Many of our space launch vehicles rely upon Russian produced engines--the U.S. has lost the technological lead. The space program provided something back then that our country lacks. We were dreamers and we set our sights on the stars. There were new horizons to conquer and the successes and the failures came almost every day. Life has become so routine since then. We still making stunning advances in space, but it has become the expectation. I was there, recently, at the Reagan Library and I saw it first hand. 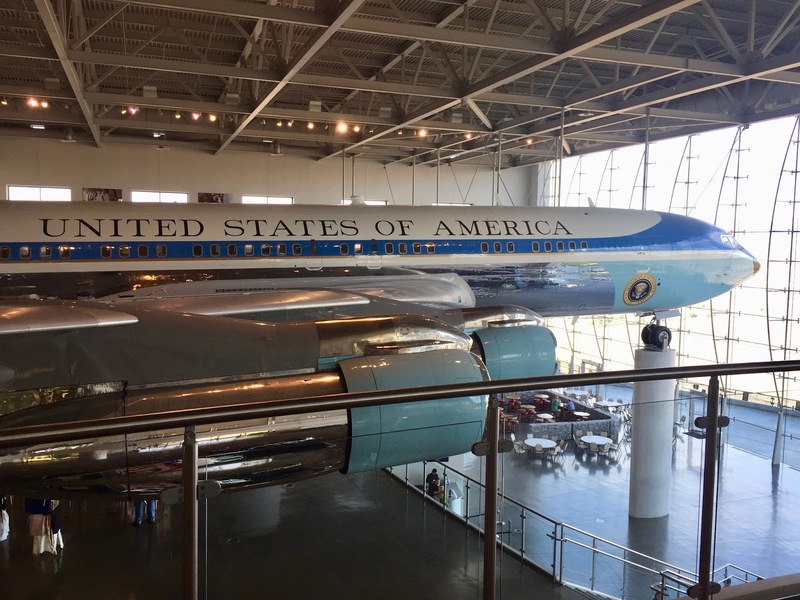 I saw and touched, and entered the aircraft that served as Air Force One during the Reagan administration. When it carries the President of the United States, it is the most important aircraft in the world! I read with fascination yesterday how the President-elect was making an issue about the purchase of two new aircraft to serve as Air Force One. It is important to note that the current aircraft are almost 30 years old. There are a lot of improvements to technology which have occurred since these aircraft first flew. When Air Force One touches down in a foreign country, it is a statement. The President of the United States has arrived and no other county's leader arrives in such a manner. It recently infuriated the Chinese and caused an incident. But Air Force one is more than transportation, It is an extension of the Office of the President. It is a working area that allows the conduct of the Executive branch to continue during long and otherwise non-productive flights. Air Force One is as much a projection of national power as sending an aircraft carrier into some country's backyard or flying B-52's along a disputed border area. It makes a statement: The U.S. is here. My Take: The President of the United States should not be transported in a 30 year old aircraft. Project power and prestige with a new symbol of national power. The President-elect needs to focus on big issues. The construction of President-elect Trump's cabinet continues to draw the attention of the news media and his expected selection for Secretary of Defense is the current hot news item of the day. I am happy the issue is not a Constitutional one, but a legal requirement imposed when the Department of Defense was created. Established during 1947 the Department did not take on its current name of Department of Defense (DoD) until 1949. An interesting twist of history. The laws that established the DoD mandated that persons being appointed to the top jobs in the Department must be separated for at least 7 years. It was originally 10 years, but later amended. And even with the newly created DoD, an exception to the law was given for General George Marshall in 1950. My point here is that the "law" has been changed in the past and the situation must be evaluated based upon it merits. Sadly, the blind application of law seems more important that looking at the merits. 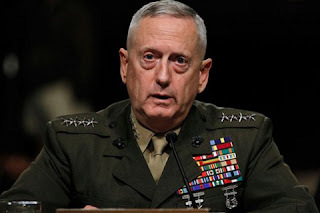 I believe it is time for someone to lead the DoD who has experienced the weapons, tools and tactics being provided by the to the troops and he may be able to separate the good from the unnecessary. I believe that the DoD is bloated and inefficient, but much of that is due to Congressional mandates. If the DoD is going to become efficient, then Congress needs to back and allow DoD to get about the task of defending the nation. Maybe General Mattis will restore some swagger to the DoD. 1. It is less than three weeks to Christmas. 2. The year 2016 is crashing to a close. I am amazed how quickly. 3. It is hard to make vacation plans if you don't know where you want to go. 4. There are a lot of Christmas specials on TV right now. I am glad they only show them once per year. 5. It is exciting to watch the President-elect put together his team. It is being done very differently than on the past. That may be good. 6. How weird is the NFL this season. Seven of the teams that were in the playoffs last year may not make the playoffs this year. 7. Thankfully, the weather has not been too miserable so far this season. 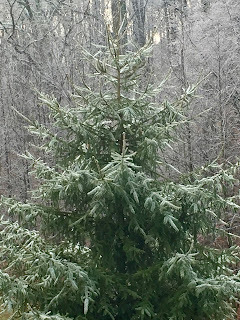 We have had a bit of rain, but no snow, yet. 9. Wine is a great addition to a holiday party. It is the season for Christmas movies on TV and stories. Last evening I watched my favorite Christmas movie, It's a Wonderful Life produced in 1946 starring Jimmy Stewart. Seasonal songs are playing on the radio, we have our favorite station that plays Christmas songs 24/7. I believe that December is the month where we combat the increasing darkness with seasonal songs. 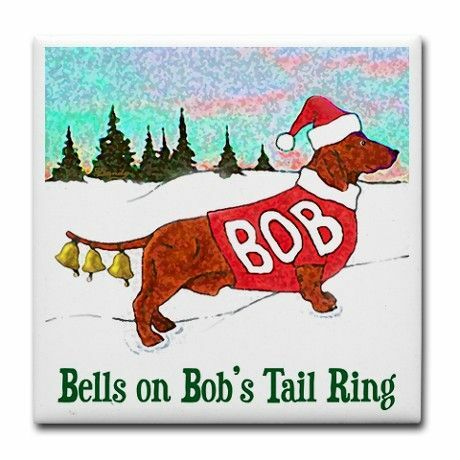 The sound of the song Jingle Bells reminds me of the joys of being a child listening for the sounds of Santa's sleigh on Christmas Eve. I am amazed at how the old songs are still the ones that I hear most. I hear Nat King Cole's The Christmas Song ten to twenty times per day. And Andy Williams is singing continuously somewhere in the background. It all works together to make the season. I enjoy the humor as well. The season is moving along so quickly. There are three weeks until Christmas! I can scarcely believe it is passing so quickly. I may even begin counting the days until I plan to open my pool. It has been an annual event, the Midnight Madness in Old Ellicott City. This year, however, it was definitely different. Old Ellicott City was almost destroyed by a ravaging flood during late July and many of the shops were not able to open. Those that did, bravely carried on the tradition. I was pleased with the turn out of people trying to make normal again that which is still under repair. 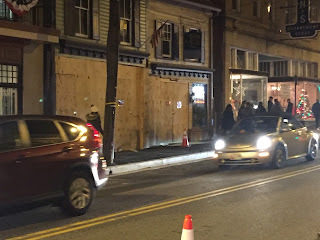 The shops near the top of the street, Ellicott City is built on a hill, were generally because they suffered less damage while those near the foot of the hill were partially open. 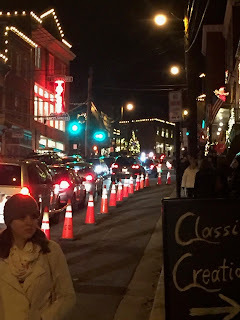 Signs of repair were everywhere, but as well, people were reveling in the cool temperatures and trying to infuse the Christmas season into their hearts. There were long line in some of the stores and I have to admit, many of the stores provided light refreshments including wine or champaign which was a very nice touch. School choirs were singing on the street and people were shopping. It was a resurgence for the city and the business district with many of the stores rushing to open for the event. That so many stores and restaurants were open was a miracle. 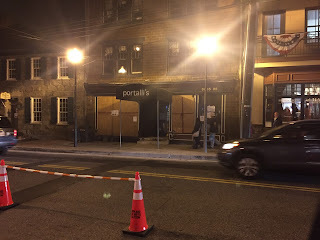 But Ellicott City remains damaged and, sadly, I know that some of the shops and restaurants will never reopen. The flood was a disaster, but the spirit to rebuild is strong. 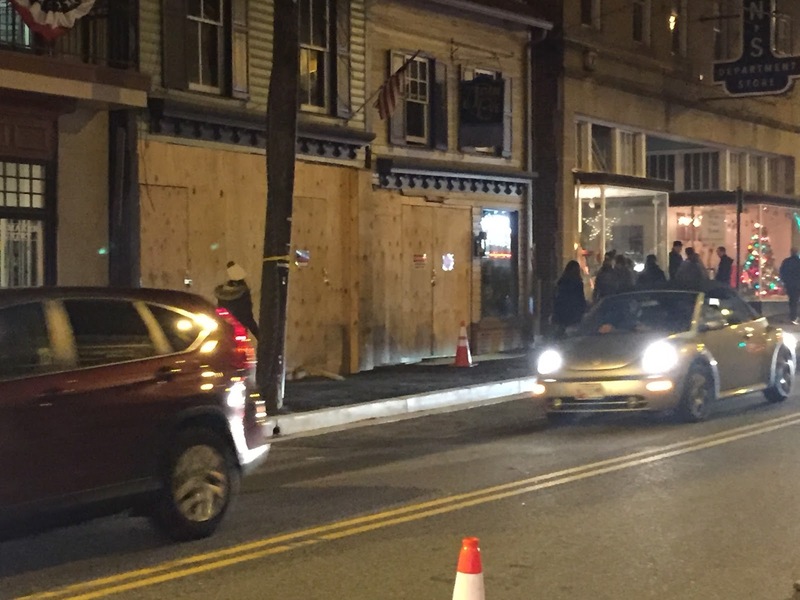 I hope that Midnight Madness provided the stimulus to encourage the rebuilding to continue and eventually restore Old (or Historic) Ellicott City to it former radiance. 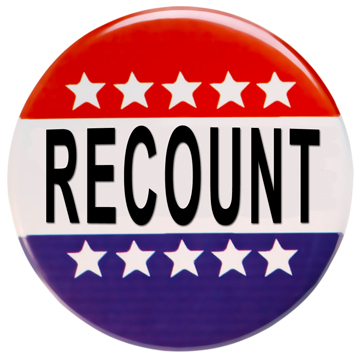 A vote recount is underway in Wisconsin, and a partial recount is underway in Pennsylvania according to a New York Times article titled, ‘We’re Going to Get This Done’: Wisconsin Vote Recount Is Underway. It seems a huge waste of money. I guess it is important to know that the electronic voting machines were not tampered with, but with Michigan falling into the Trump vote column the other day, the lead seems insurmountable. Losing is hard to accept for some people especially given the breakdown of the popular vote, I get that. But we have to have faith in the integrity of the voting system. Yes, I am one of the first to say things like, "Vote early, vote often!" But I don't mean it. I say it just to encourage people to get out and exercise their right, or is it a privilege, no it is a responsibility to vote. As the world has changed from paper ballots to computers, we do need to ensure that the computer tallies cannot and are not tampered with. Recount? Not to change the outcome, but rather to confirm it and provide confidence in our automated vote counting process. One of the campaign slogans during the recent national election was "Make America Great Again." I always took exception to that phrase because I could not determine when America stopped being great. In my mind, America remains the greatest country on the planet. And why do I believe this? It is not because of our military, there are large militaries, but none better equipped than ours. It is not because of our leadership, because we all have seen through the facade of Washington. It is not because of our economy, even though we are one of the strongest and most resilient economies on the planet. It is because of our people. "The greatness of America doesn't begin in Washington; it begins with each of you -- in the mighty spirit of free people under God, in the bedrock values you live by each day in your families, neighborhoods, and workplaces." America is and always has been great! I know that it is not the summertime when I look forward to the Dog Days, but even as the winter approaches and the total amount of sunlight drops towards its solstice low of 9 hours and 24 minutes, some days are devoted to dogs. Today, for instance, Makayla has a check-up and dental appointment. She gets her teeth cleaned once per year. It is funny that I, too, have an appointment this afternoon for a dental cleaning. So this morning I will drop her off at the vet and pick her up this afternoon. She hates being dropped off. She exhibits real signs of separation anxiety. But I know she will be fine and that when the afternoon arrives and I can pick her up, she will be very ready to see me. And her breath will smell good, too.